British police has finally arrested the WikiLeaks founder Julian Assange from the Ecuadorian embassy in London after Ecuador government withdrew asylum citing his bad behavior. The arrest has closed the seven year long dramatic stint which could end up in landing in a United States prison as he is facing a hacking conspiracy charge. According to an indictment Assange conspired with former Army intelligence analyst Chelsea Manning to steal, and publish classified documents. 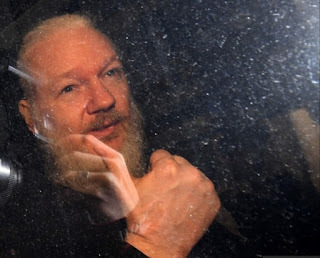 Soon after his arrest, Assange appeared before Westminster Magistrates’ Court, where District Judge Michael Snow found him guilty for breaching his bail conditions, flatly rejecting his assertion that he had not had a fair hearing and a reasonable excuse for not appearing. While, Assange waved to the public from the gallery as he was taken to the cells. His next appearance would be on May 2 via prison video-link for his extradition case. Whereas his attorney, Jennifer Robinson, said he will fight any extradition to the U.S.